In terms of headlines over the past month, it’s been a close run thing between Immediate/Instant Payments and Distributed Ledger Technology. Both were prominent topics at Sibos last month. 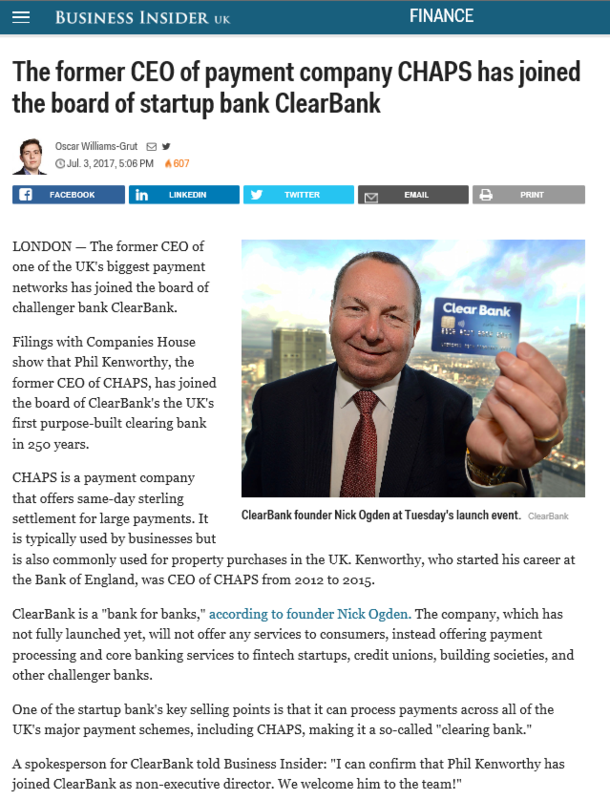 However, the former has had some heavyweight headlines behind it, including the recent announcement that The Clearing House in New York had signed a letter of intent with Vocalink for them to help in the delivery of a new Real Time payment system in the US and, last week, the announcement by the UK Faster Payments System that they were lifting their Payment Limit to £250,000 per transaction and introducing pre-funding (a means of reducing Settlement Risk in what is a Deferred Net Settlement system, thereby providing a more level playing field for Challenger Bank Access into the system). In parallel, developments continue across a number of countries with respect to 24×7 Instant Payments. Most consumers already enjoy the benefit of an “immediate” payment by virtue of their ability to pay for something using a debit or credit card. They can already gain immediate value by being able to take the goods they have purchased at the point of sale. In turn, the vendor has comfort that the payment will be honoured. The latest statistics published by the Payments UK Trade Association (available here) make very interesting reading. In September 2015, 85% of all payments settled in the UK across the four main payment systems were pre-timed payments (either debits or credits). This is notwithstanding the fact that the UK has one of the most advanced Faster Payment Systems in the world available to its Banking population. Indeed, the stats highlight that nearly half of all payments handled by FPS are standing orders or future dated payments. This key statistic of 85% is driven by the fact that most payment requirements are known in advance and are therefore “programmed” to take place on a certain date (look how many direct debits people have set up against their bank accounts). Notwithstanding the uptake of mobile banking and other “ease of use” payment channels, the statistics also show that the total number of such timed payments is actually increasing (4% year on year) as opposed to decreasing. In parallel, looking at the month of September 2015 versus September 2014, the uplift in Faster Payment Transaction volume is virtually all accounted for by a drop in Cheque based transaction volume thereby indicating a shift in consumer usage of payment types but not a change in timed versus untimed). Is there a potential need for any of the 85% taken up by Timed Transactions to become “immediate” as opposed to Future Dated? For the remaining 15%, how much faster does a payment need to be? It is clear in the UK that Consumers are favouring use of the Faster Payments system with its two hour settlement time as opposed to the six day settlement cycle of Cheques. This trend may slow though with the introduction of Cheque Imaging and next day settlement during 2016. Taking the first question, the fact that the volume of timed payments is rising as opposed to decreasing is a clear indication that there remains clear demand for this type of payment. If the UK or other countries were to move to more consolidated Payment Systems at a future date, they are likely to need to retain the ability to settle daily batches of timed transactions rather than looking to channel all of these through an instant payment settlement channel with the ramifications this would bring with respect to performance, capacity and resilience. How can AML and Sanctions checks be performed in a truly real time payments environment? Payments can readily clear on an immediate basis when customers bank at the same bank (via internalised settlement). However, payments “chains” commonly exist where end users bank with Payment Service Providers who are not Direct Participants in the core Payment Systems and therefore rely upon correspondent/agency arrangements with other PSPs who are Direct Participants. End to End payment may therefore involve a number of intermediaries on either side of the Payment System. It is not clear how immediacy could readily work in this situation. In summary, there is doubtless a need for Faster Payments across country locations (particularly where such systems do not currently exist). However, statistics speak for themselves and, with only 3 out of every 20 payments in the UK appearing to require settlement in this fashion, there are some difficult questions the broader payments industry will need to face in the coming couple of years in terms of attempting to define the end-user need for “immediate” or “near immediate” payment settlement and the scale of investment that should be invested to support this.